To help scientists and engineers follow the action 154 million miles away, the trajectory of the Mars Science Laboratory was set up to make sure the rover's descent to the surface of the red planet occurs within view of three orbiting satellites. 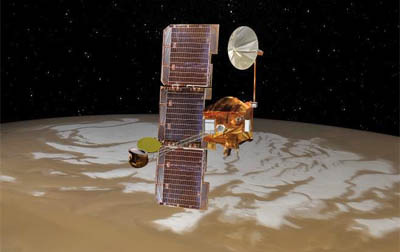 NASA's Mars Odyssey and the Mars Reconnaissance Orbiter, along with the European Space Agency's Mars Express satellite, will capture telemetry from the Mars Science Laboratory as the spacecraft makes its nail-biting seven-minute plunge to the floor of Gale Crater early Monday U.S. time. But Odyssey is the only one of the three capable of "bent pipe" realtime relay, sending the UHF telemetry directly back to Earth to give anxious engineers what amounts to continuous play-by-play updates, including confirmation of landing. Touchdown is expected at 1:17 a.m. EDT (GMT-4) on Aug. 6, but confirmation will take 13.8 minutes to cover the 154 million miles between Earth and Mars, arriving around 1:31 a.m. Unexpected problems with Odyssey's attitude control system in June changed the satellite's orbit slightly, putting it out of position for realtime data relay. But on July 24, a short rocket firing was carried out that moved the spacecraft six minutes ahead in its orbit. That should enable it to beam back telemetry during most of Curiosity's descent as originally planned. "Odyssey has been working at Mars longer than any other spacecraft," Gaylon McSmith, Mars Odyssey project manager, said in a NASA statement. "So it is appropriate that it has a special role in supporting the newest arrival." MRO will record telemetry throughout the descent and play it back after processing. That data should start reaching Earth several hours after landing. MRO also will attempt to snap a picture of the MSL descent stage after parachute deploy. The Mars Express will record most of the descent and then turn back toward Earth to relay the stored telemetry to European flight controllers. They will quickly pass it along to NASA. But Odyssey is the key to realtime confirmation of a successful landing. "It'll depend on how well the link is performing, what the geometry is," said Steve Sell, an entry, descent and landing engineer at the Jet Propulsion Laboratory. "There's some uncertainty in our touchdown time just based on winds, how long we're on the parachute, atmospheric density, things like that can actually spread our landing time by about plus or minus a minute or so," he said. "So depending on exactly when we touch down determines how long we actually keep that Odyssey link active." As a backup, the Mars Science Lab also will transmit simple tones directly back to Earth during the descent that will check off major events. But Earth will drop below the horizon as viewed from Curiosity well before landing, cutting off direct line-of-sight communications. "The spacecraft will transmit what we call X-band tones," Project Manager Pete Theisinger told reporters earlier this month. "The landing site's not visible from Earth at the time of landing, so those tones will cease to be received on Earth sometime between the time the parachute deploys and the heat shield separates. So at that point, we will know it's there and we should see (the velocity change confirming) the parachute deploy. "MRO will get the full extent of the entry, descent and landing from before entry until after landing. But that's a store-and-forward system and so the data will be returned to Earth three or four hours later."